I have to admit I didn’t know much about Colombian Coffee before we visited and made it our mission to learn as much as we could. You can’t go to a major coffee drinking nation like Colombia and not learn at least a small amount about one of their largest industries. Coffee is everywhere in Colombia. Our trip spurred my enthusiasm to learn as much as I could about Colombian coffee. I wanted to know where to find the best coffee beans and what the best brands were. I wanted to learn why it was considered some of the best in the world. Basically I wanted to take a crash course in coffee. Obviously, I knew I wasn’t going to become as well versed in coffee as I am in tea or wine in the short 10 days we had to spend in Colombia, I mean, what better place to learn than in the capital of coffee? If you’d like to know more about coffee in Colombia, we’re going to give the complete run down right here. So while we were in Medellin, Colombia, we started out drinking as much coffee as we could, and booked ourselves in for a crash course in coffee drinking at the Toucan Cafe. It was there that we met certified SCAE barrista, Andrés Paniagua (find him on Instagram), who is an expert coffee cupper, on his way to being a Q Grader (certified coffee taster). Andrés was the perfect teacher for my quest to become coffee literate. He knew all the necessary skills we would need to perfect in order to truly understand good coffee. You might be wondering what you might possibly need to know. If it tastes good, it’s good, right? While that’s absolutely true, and extends to everything in life – if you like it, it’s good – there are so many aspects of truly “good” or, better said, “high-quality” coffee. If I thought Seattle was a major coffee city, I was in for a shock when I heard about Colombia’s coffee production. There are more than 563,000 families producing coffee in Colombia. Most of the coffee farms are not much bigger than 2 hectares. They are family operations, through and through. There are very few large coffee producers, so it’s not that difficult to avoid the major brands and find small, artisan brands that do everything themselves, from cultivation to production. When you consider the numbers of coffee farmers, you can easily see how important coffee is to the economic and social prosperity of Colombia and its people. You see, not only is coffee a main source of income for many Colombian families, it is a highly regarded and beloved pastime, as well. The online magazine, Thrillist, summed up coffee drinking in Colombia well by saying, “It’s primarily something to be shared, a ritual to gather around, and less of a functional shot in the arm.” While Americans drink coffee more as a way to power through the day, Colombians don’t drink it for the caffeine boost. The coffee in Colombia is not just your average, run of the mill coffee that you can find in any grocery around the world. Because of the personal attention that can be given to the plants on these small farms, and the fact that the farms are at high altitude, the result ends up being a very mild, well-balanced bean. This translates into a lighter, oftentimes fruitier tasting coffee. The average annual coffee production in Colombia is 11.5 million bags, the third highest production in the world, after Brazil and Vietnam. I asked this question of a tour guide in Bogota and received the answer that you must taste and taste and soon you will uncover your favorites, and those are the best Colombian coffees. I think what he was getting at was that the best is determined by your own tastes, and it’s impossible to tell someone what the best is when you don’t know their tastes. It’s important to note that Colombia produces so much coffee that it’s possible to break down Colombian coffee into small regions. So, not only must you learn about Colombian coffee in general, you need to learn about the regions and the difference in terroir that affect the final taste of the coffee. That seemed like an unattainable feat for me to conquer in just one week, but that was before Andrés came into the story. First you have to learn about the coffee-making process, so you know what you’re drinking. Then, with enough time and fortitude (there’s a lot of caffeine involved), you can learn to become an amateur cupper yourself, and through this process you can begin to uncover the characteristics that are present in the type of coffee you prefer. This practice will eventually lead you to the region and then to the exact coffee producer or Colombian coffee brand that you most prefer. One of the most fascinating parts of learning about coffee is seeing how it’s made. I obviously knew the beans were roasted, but I didn’t know the rest of the process. I also didn’t know the beans started out as these beautiful red berries. In Colombia, the trees flower twice a year, so there is a primary and secondary harvest. Once the coffee berries are ripe, the berries are harvested by hand in a very laborious process (imagine walking along steep terraces high up in the mountains). Since not all of the berries will ripen at the exact same time, the picking often continues for days, as the farmers walk pick only the ripe ones. There are two ways that coffee gets processed. There’s a dry and a wet method. In the dry method, the whole beans are spread out on a large surface to dry in the sun, and are turned throughout the day to prevent mold. It can take about 2 weeks of the beans to dry to approximately 11% moisture content. In the wet method, the outer pulp is removed from the bean, then they are sorted in a water bath, and placed in water-filled tanks where they will ferment for 24-48 hours. After fermentation, they are once again washed and then laid out to dry also to 11% moisture content. The next step in the process is hulling. Since the dry-method beans still have their casing, the hulling process removes it. For the wet-method beans, hulling just removes the outer layer. All of the beans are then polished, graded and sorted by size. As I mentioned earlier, there are many coffee growing regions in Colombia, but there are three main regions that are the most developed. 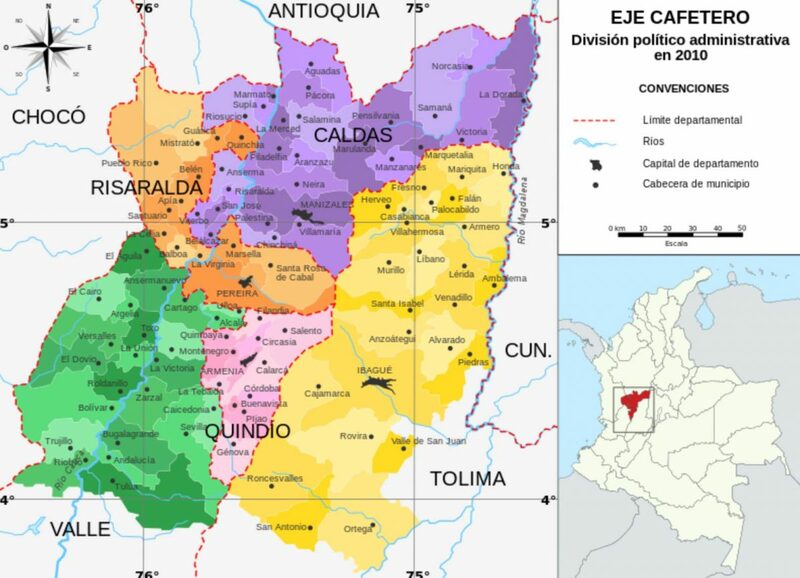 The area between the regions of Caldas, Risaralda and Quindío are often referred to as the coffee triangle or coffee zone. Other regions include: Nariño, Norte de Santander, Antioquia, Valle del Cauca, Huila, Tolima, and Cundinamarca. See the map below for an idea of how these regions are laid out. As with wine, the region imparts a specific terroir on the coffee that gives it specific characteristics that you can begin to identify once you’ve tried enough Colombian coffee to become familiar with them. When purchasing coffee in Colombia, you can’t really just buy a generic coffee. You will find regional information on each package, so you can make a much more specific purchase. Having almost no previous knowledge about coffee, Andrés had his work cut out for him with us. We were practically blank slates, waiting to be educated. After learning the history and production methods of Colombian coffee, which are very important to understanding the final product, we dove into the art of tasting. 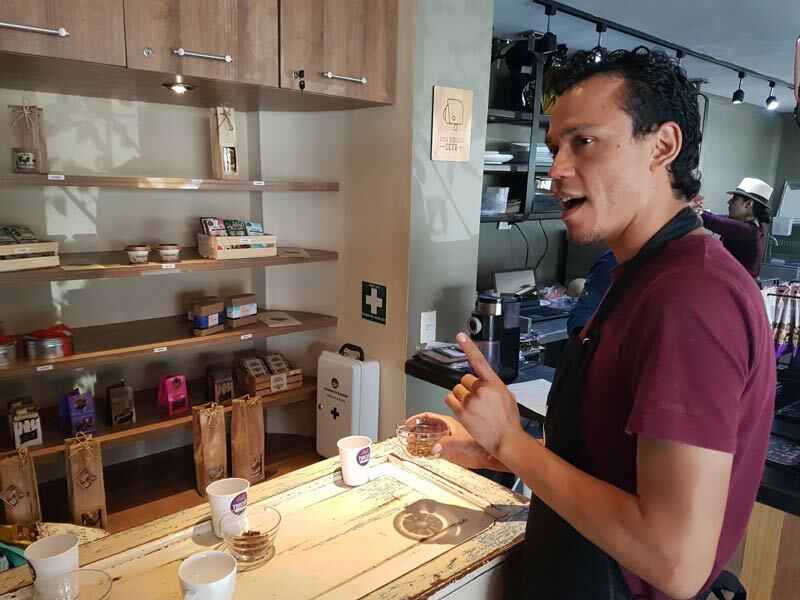 A coffee cupper like Andrés uses a variety of methods to assess a coffee. The procedure involves deeply sniffing the coffee, then loudly slurping it, so it spreads to the back of the tongue. He then contemplates the coffee’s taste, mouthfeel (the body and texture), sweetness, acidity, flavor, and aftertaste. We started to learn by smelling give different freshly ground beans (different regions, different brands, etc), in order to train our senses to identify certain characteristics. Andrés then brewed the coffee and we moved on to deeply sniffing the coffee. We picked out aromas of fruit, flowers, nuts, chocolate, etc. Then it was our turn to loudly slurp the coffee to fully taste the coffee. We tasted many of the same flavors we smelled – sweet, floral, acidic. It didn’t take long for us to start identifying the different characteristics of the coffees and to determine which ones we preferred. That led us to be able to select a region or two that we gravitated to. Don’t think the training is over just yet! There are many ways to prepare a cup of coffee. I’ve only really ever seen the basic drip coffee maker method. But these days, there are many different gadgets that you can use to make the perfect cup. The Aeropress obviously benefits from the pressure of pressing down on water in the tube so that it strains through the coffee faster. You must first wet the filter, then place it inside the cap of the Aeropress, which you then place on your mug. Then you load it up with your coffee grounds and pour in the water. You stir it once to mix up the grounds. Then insert the plunger and press down until the coffee is entirely filtered through. Learn more about the Aeropress here. The pour over method is a much slower, gentler process. You can make it yourself without a gadget, as long as you have the required tools. The most popular gadget is featured in the picture here. 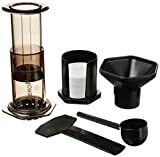 You need a dripper, or a cup/funnel with a hole in the bottom. You place the dripper over your mug. Wet the cone-shaped filter and place it inside the dripper. Then, pour a small amount of the hot water in a circular motion, starting on the outside rim and working your way in, over the grounds to wet them. This is called blooming. Wait for about 30 seconds before proceeding to pour the water slowly, circularly, over the grounds. Once all the water has filtered into the cup, it’s done. 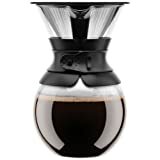 If you’re looking for one of these unique coffee makers, we have a great list of our favorites to share with you. If you’re interested in taking a coffee tasting course, like we did, you can contact Toucan Cafe in Medellin to set one up. The class lasts about 2 hours and teaches you a LOT. Learning about Colombian coffee in one week was definitely a crash course, but it was also one of the funnest things we did there.